1. Experiencing our first flight with Liam and bringing Liam to the beach. Our Florida trip was an awesome time together. I loved introducing Liam to the beach and having him explore. He ended up loving the sand and the water. Those videos and pictures are some of my all time favorites. 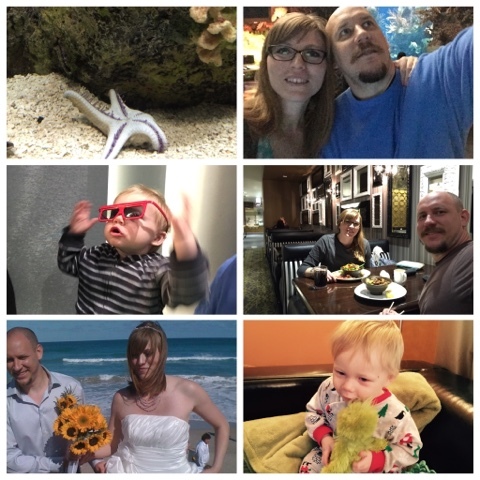 I blogged each day on our Florida trip. I wanted to remember EVERYTHING. Turns out, Liam LOVES the BEACH! 2. Jumping with my mom's group. We took our kids to this awesome trampoline place the other week. We had a blast jumping in the different areas with the kids. Auntie Meg came with us too. We had Pot Belly's afterwards and made a quick stop at Target. 3. Celebrated our fourth anniversary at the boat. We had a classic movie and dinner date for our fourth anniversary. It was fun watching the new Star War's movie and eating dinner at the boat. The buffet was pretty good. 4. Slow mornings making french toast together. We have had a lot of mornings lately where there is time to make french toast and enjoy a slower morning. 5. Creating sensory bottles. I love the idea of making a fun sensory bottle for Liam. My first attempt didn't go as planned. I put way too much glitter in the first bottle. I need a redo, but I'm still loving the idea of this. 7. We celebrated my Dad's birthday this month. We had pork chops and chicken at his house, and Megan made German Chocolate Cake since it's my dad's favorite. How sweet! Liam enjoyed running around dad's house. He loves to do laps. 8. Visited the Shed Aquarium. We had an amazing time at the Shedd this month. It was a free day, and we spent $20 to visit all the exhibits. The Coral Reef was by far our favorite thing to explore at the Shedd. It's truly amazing. We even went twice to see everything again. I love having those memories with Liam even if he won't remember. 10. Baking cookies even after the holidays. I love doing this. This idea goes back to reminiscing about the holidays. I love baking cookies for this exact reason. I love this recipe for Ginger Bread Cookies. They always turn out good. I like putting red cinnamon disks on them. 11. Bill put a backslpash in our kitchen this month! He got me it as surprise for Christmas. I was so happy with the tiles he picked out. It was exactly what I had wanted. He installed it one afternoon, and it only took him an hour. Amazing! We also picked out the silver grout that looks awesome. It definitely compliments the tile.